Alice Wilson Adams (94) died October 4 after a long and courageous battle with Alzheimers at the Quality Health Nursing Home in Fernandina Beach, FL. Alice was born in on October 31, 1922 to Ruth and James Wilson in Asheville, N.C. where she graduated from Stevens Lee High School in Asheville, N.C.
Alice married Ralph B. Adams on August 4, 1942 in Long Branch, New Jersey. They were married for 67 years. Ralph preceded her in death in 2009. To their union they had two loving daughters, Joyce Adams Frink (Neil) of Fernandina Beach, FL and Beverly Adams Mantz of Washington, DC. Alice also had a devoted step-daughter, Xernna Adams Davis (William) of Pittsburgh, PA. She has one grandson, Sharif Adam Frink (Dania) of Jacksonville, FL. The second oldest of ten siblings, Alice leaves to mourn her sister, Harriet Wilson Danner of Asheville, NC; Daisy Wilson Jones of Columbus, OH; her brothers, Larry Wilson and George Wilson of Columbus, OH. Alice leaves many loving nieces, nephews and friends as well. Alice received her bachelor's in Early Childhood Education from Philadelphia Community College and master’s degree in Education from Temple University. 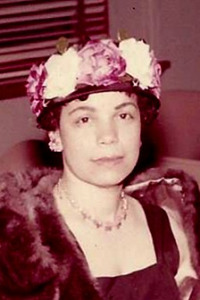 She and Ralph raised both their daughters in Philadelphia where she also taught in public schools for 10 years. After which, she moved back to Asheville with Ralph and taught for 29 years until retirement and then moved to Florida. She was also an active in member of Delta Sigma Theta Sorority, Inc. in both Asheville and Jacksonville until she wasn’t able to participate due to her decline in health. Services will be held on Oct. 12, 2017, 11 a.m. at St. Peter’s Episcopal Church in Fernandina with burial at Pine Green Cemetery in Yulee. The family will receive friends from 5 :00 until 7:00 p.m. Wednesday at the funeral home.